The onset of winter has me inspired. After a subpar shooting season in 2018, leave it to a modest snowfall to turn the tide. First came the photo I made at Stafford Forge—an inspired output that pleased the residents of your favorite social media platform. Two days later, when a fine splash of color made an appearance over the familiar expanse of Dock Road marsh, I was there, and I was ready. A calming sight—the serene scene. 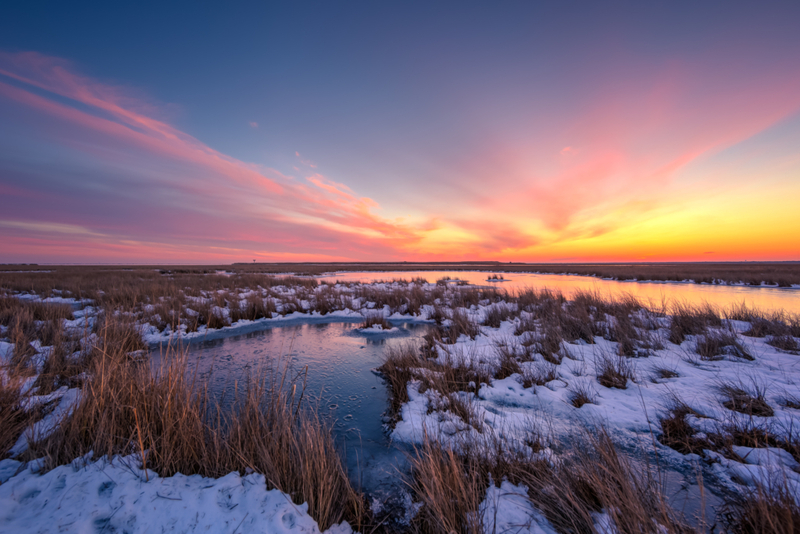 Ice creeping in atop staid tide pools, snow pack propping up marsh grass, and sublime pastels coloring the sky with a master’s touch. I had great company, too. My girlfriend’s two year old daughter made the trip with me. An excellent co-pilot if there ever was one. We hung out roadside taking in the bracing air and pretty pinks in an understated bonding moment. I even had her pop off a few shots of her own, hoping to bring joy to the next generation of photographers. It’s remarkable, really, the intensity and focus an untarnished brain brings to new encounters. I’m not sure where we lose that capacity as adults, but we are no doubt poorer for it. Oh for the wisdom of babes.